We Agilists tend to be a passionate bunch. We ground ourselves in the principles and often too, the practices. We can get pretty rooted in our beliefs and lose sight of our biases. As coaches and mentors, we owe it to ourselves and those around us to stay mindful of the positions from which we operate and work to practice active inquiry. Never Would I Ever! is an adaptation of the traditional drinking game, and (according to actual participants) provides just as much fun! From newbies to veterans, game players arrive at new insights and clarity around Agile principles and practices. In the game, a volunteer nominates a strongly-held position, and for 4 minutes, others ask questions in service to understanding the reasons for the particular belief (but not to refute it). In the subsequent 4 minutes, players then suggest scenarios in which the volunteer might change his or her mind. There are multiple learning outcomes to the game. Volunteers have the space to clarify their beliefs and re-examine any biases. All participants experience the value of powerful questions and active listening. The emphasis is on humble inquiry (the art of asking, not telling) and recognition that stated positions don’t need to be binary or polarizing. A couple of brain-based learning methods are in operation in this Agile18 workshop. When we engage in game playing, our brain chemistry is a little different. Fun and laughter typically mean that emotional stakes are low and our defenses drop. We can make mistakes in a risk-free setting and through experimentation, we actively learn and use new skills. We can practice behaviors and thought processes that are transferable from the simulated environment to real life. Double-loop learning allows us to examine underlying actions and thoughts. Where single-loop learning involves changing methods and improving efficiency to reach established objectives, double-loop learning involves changing the objectives themselves. Double-loop learning is helpful when we want to examine the mental model on which a decision depends. See more or save this workshop to your schedule. The Omaha “Training from the BACK of the Room” class held this month has been completed and now the “real work” begins – with “Follow-Ups,” of course! Here are the Follow-Ups for the participants of the TBR class. http://www.blueshiftinnovation.com/wp-content/uploads/2016/03/BlueShift-Logo-600x250.png 0 0 Jenny Tarwater http://www.blueshiftinnovation.com/wp-content/uploads/2016/03/BlueShift-Logo-600x250.png Jenny Tarwater2018-07-01 13:24:432018-07-04 14:59:34TBR Follow Ups! If you have read any of Sharon Bowman’s books, you already know about “Warm-Ups.” And you already know about TBR (“Training from the BACK of the Room!”). 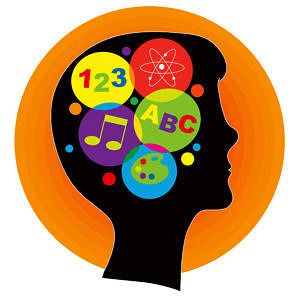 “Warm-Ups” are short, quick, optional pre-program activities that brain scientists call “priming.” Warm-Ups informally introduce learners to concepts that will be formally covered in traditional instruction in the near future. Before any training or class, and especially before our 2-day TBR train-the trainer program, we always email Warm-Ups to registered participants before the training dates. The Warm-Ups familiarize participants with some of the concepts that will be covered during the class. When the formal instruction takes place, participants will be able to make more mental connections and deepen their understanding of the concepts because of the Warm-Ups. Below are the Warm-Ups that we are sending out to registered participants for the upcoming “Training from the BACK of the Room” class in Nashville. By doing these Warm-Ups, you will become familiar with many of the important concepts that are crucial to the success of any brain-based instruction. These are all optional… but I encourage you to check out some of these gems! 1. Click on the TBR website’s MICRO-COURSES page and view three of the short, image-rich slide presentations there. One you should view is “The 6 Trumps.” The other two are ones you will choose that interest you. 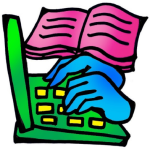 During the upcoming class, be ready to summarize what you learned from these micro-courses. 2. Watch “Move. Don’t. Sit. Still” and “Sticky Teaching” on the SLIDES FROM SLIDE SHARE page. Then watch one more slide presentation of your own choosing. Again, be ready to give a short summary about one of the three slide presentations to your table group during the class. 3. 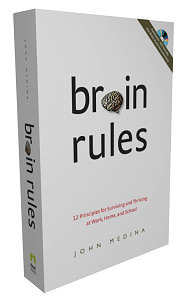 On VIDEOS FROM YOUTUBE, watch “Rethinking Learning: An Introduction to Brain Rules” by John Medina, a molecular biologist and the author of one of the best brain science books of the 21st century. If interested, watch one or more of the slide presentations marked “next” that follow this one. 4. If you haven’t yet watched an RSAnimate production on YouTube, you’re in for a treat! Log onto VIDEOS FROM YOUTUBE and watch “Changing Education Paradigms” – a ten-minute “fast-draw” presentation about the history of education and present day implications for all trainers, instructors, and learning facilitators. If you have read any of Sharon Bowman’s books, you already know about “Warm-Ups.” And you already know about TBR (“Training from the BACK of the Room!”). And you may already be planning to attend the TBR class on November 15-16, in Kansas City, MO. If you are interested in going and not yet signed up, go here. Before any training or class, and especially before our 2-day TBR train-the trainer program, we always email Warm-Ups to registered participants about 2 – 3 weeks before the training dates. The Warm-Ups familiarize participants with some of the concepts that will be covered during the class. When the formal instruction takes place, participants will be able to make more mental connections and deepen their understanding of the concepts because of the Warm-Ups. Below are the Warm-Ups that we are sending out to registered participants for the upcoming “Training from the BACK of the Room” class in Kansas City. Whether or not you’re attending this class, you might be interested in doing some of these short, quick activities, if you haven’t already done so. By doing these Warm-Ups, you will become familiar with many of the important concepts that are crucial to the success of any brain-based instruction. 4. Interview someone who, in your opinion, is an expert in training or teaching others. Find out what he or she considers important whenever face-to-face classroom instruction is done. Be ready to summarize the interview for your table group during the class. 5. If you haven’t yet watched an RSAnimate production on YouTube, you’re in for a treat! Log onto VIDEOS FROM YOUTUBE and watch “Changing Education Paradigms” – a ten-minute “fast-draw” presentation about the history of education and present day implications for all trainers, instructors, and learning facilitators. The Kansas City “Training from the BACK of the Room” class held this month has been completed and now the “real work” begins – with “Follow-Ups,” of course! And here is a heartfelt note of gratitude to Hallmark and Mary Donnici and Leslie Maness for their training sponsorship and for their behind-the-scenes help to make the training days so successful. ? http://www.blueshiftinnovation.com/wp-content/uploads/2017/07/download1.jpeg 159 318 Jeryn http://www.blueshiftinnovation.com/wp-content/uploads/2016/03/BlueShift-Logo-600x250.png Jeryn2017-07-21 13:40:322017-07-12 16:26:21TBR Follow-ups! 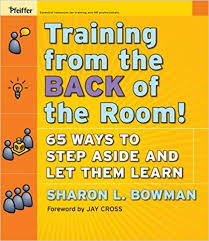 If you have read any of Sharon Bowman’s books, you already know about “Warm-Ups.” And you already know about TBR (“Training from the BACK of the Room!”). And you may already be planning to attend the TBR class on July 27-28, in Kansas City, MO. If you are interested in going and not yet signed up, go here. We had a blast at our April GALE Meetup. We combined groups with our friends at Agile KC this month. We saw several new faces and everyone had a great time. Big thanks to Dave Grace from Adaptive Solutions Group for sponsoring! Our theme was “Best of Agile Games New England which was held March 6-8 in Boston. 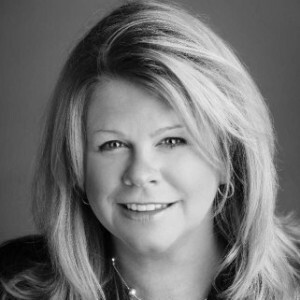 Jenny Tarwater attended, and brought some great ideas back to Kansas City! We dotted voted on six/seven of those to play during the evening. (See dot vote pictures below). We kicked off the evening playing Happy Salmon! This game was a HUGE hit. It is one of the fastest and easy to learn games I’ve ever played – it’s literally impossible to keep yourself from smiling! Even just seeing the package the game comes in makes people happy! This is a great ice breaker game, especially if you have new people. We broke into groups and played several of the other games. 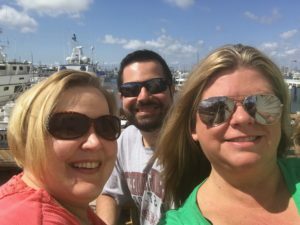 We experienced some authenticity exercises that Sara Ness brought to Boston. Zegg Forum. This was big. A participant would describe a real problem they were facing at work. Other members would listen to the problem and restate it in their own words, then include a potential solution. It was amazing how much clarity was gained by hearing someone restate your problem and provide a potential solution. It was a big success. Friend/Enemy. We experienced interesting group dynamics and felt loyalty and betrayal playing Friend/Enemy. We played a game that scales well: Ultimate Paper Rock Scissors! We tried to sync up and see how long it took everyone to throw the same thing…we found it took about 7 tries. It was an interesting exercise about group mentality. One team played a game that taught nuances of User Stories. 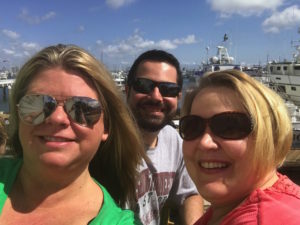 The game was created by Damon Poole and Gillian Lee…. and you can download the game here. Thanks to everyone who joined us and participated, we look forward to seeing you again soon. And check out other upcoming Agile activities on the Agilehood Calendar. Our next Meetup is scheduled for June 1. Please join us! Spring is almost here and Royals baseball isn’t the only thing to be excited about!! 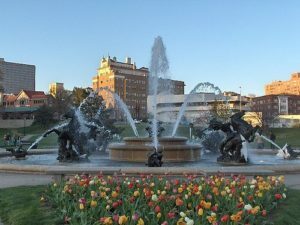 There are several upcoming events in the KC Agile community. There’s something for everyone, from beginner to expert and we can’t wait to see you at one or more of these events! Innovation Games: Check back for details about another visit from Luke Hohmann, creator of Innovation Games and the Conteneo Weave platform! This will likely be in 2Q. Also please join us for regular meetups – such as the Agile KC, Limited WIP and Agile Game Night! Today, the world comes together to celebrate #GivingTuesday, a global day of giving that unites thousands of organizations around the world to give back. Giving is an integral part of Blueshift Innovation. We have joined Pledge 1%, an organization that is making giving a part of the DNA of companies of all sizes, helping them to give 1% of product, time, proceeds, or equity, to charities of their choosing. It was only 2 years ago (on #GivingTuesday 2014) that Pledge 1% was founded, and already 1,200+ companies in 38 countries have joined the movement. If you haven’t taken the pledge, I encourage you to do so at pledge1percent.org. #GivingTuesday is a day all about giving back. Give today and give every day by taking the pledge and making giving part of your everyday business. See Blueshift Innovation’s commitment to Social Responsibility. Currently, we donate time to Girls in Tech KC initiative.